What would Halloween related reviews for October be without taking a look at John Carpenter's holiday classic simply known as Halloween. So how does this movie hold up almost 40 years later? Let's take a look. 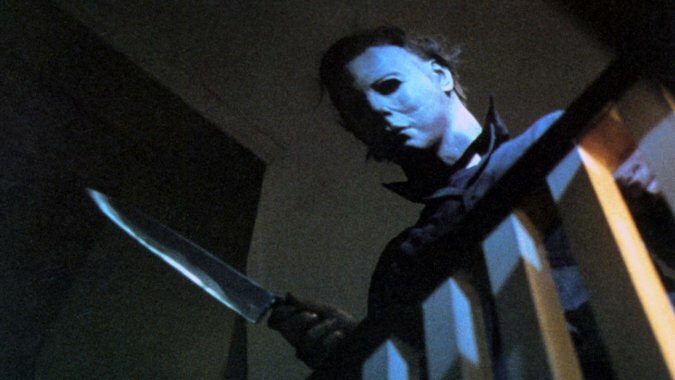 So the movie starts off in a little town known as Haddonfield exactly 15 years before the major events of the film as a young boy known as Michael Myers is spying on his older sister from outside the house. This eventually leads him inside where he grabs a knife and a mask to stab the hell out of her. It is a pretty disturbing moment to start the movie but it was never the actual stabbing that disturbed me, in fact it's the moment where his parents take off him mask to show him as an ordinary boy. He doesn't look creepy or like an obvious killer, he just looks like your run of the mill 6 year old which is quite unsettling. We then cut to the present day (1978) where young Michael is now much older and has escaped the insane asylum holding him with Dr Loomis (Donald Pleasance) hot on his trail. We also follow high schooler Laurie Strode (a debuting Jamie Lee Curtis) as she prepares to babysit on Halloween night, unaware of the terror of the night ahead as Michael attempts to hunt her down along with her friends. I still love just about everything in this movie even after watching for what must be like the 20th time in my life. It's the slasher movie that all other slasher movies try to be even to this very day and none have done it as well as this. There's a reason why it was in my top 10 favourite movies list. First of all the music is terrific and the film is even introduced with the opening theme that is now considered iconic and is a favourite of those looking to be spooky. Even without the main score the music used throughout is so well done whether it be the rising tension scenes of Myers chasing down another victim or the sudden jolt whenever he pops in out of nowhere. It definitely does it's job horrifically well. Speaking of the devil (almost literally) Michael Myers is easily the best part of this whole movie and there's a reason why he's so iconic when it comes to horror. While he may have grown up inside asylum walls, he's not just some brute looking to kill whatever is in his path. No, he plans his attack by stalking his victims throughout the day before picking the perfect moment to strike. He's creepy as hell and there are some shots of him (such as the image above) that may creep around in your nightmares forever. It also helps that Dr Loomis builds him up as some sort of icon of evil, like a demon and it really makes him seem like this unstoppable force that will stop at nothing until he gets what he wants. My only slight issue with film is that the acting can be quite corny at times from the side characters and can be laughable at times. I do think that this is made up by a great first performance from Jamie Lee Curtis (who, aside from Ripley, is the best final girl ever) and a brilliant showing from Donald Pleasance who would end up in quite a few of these movies and would generally always be the best actor in them. The movie does have a slightly slow build up especially if you've seen it quite a few times like myself, but there are still some scares to keep newcomers on their toes or hide their eyes behind their hands. It's worth it though as leads the fantastic final 20 minutes which has some of the most tension filled scenes ever put to cinema. I won't spoil it but after watching it I doubt you'll ever feel safe in your own house again. Overall this movie definitely holds up today and is still the golden standard of slasher and horror movies alike. Whenever October 31st rolls around, this one always deserves to be on any Halloween watchlist. Highly recommended.